This will work on any Android smartphone/tablet devices including Galaxy S2, Galaxy S3, Galaxy S4, Galaxy S5, Galaxy Note, Galaxy Note 2, Galaxy Note 3, HTC One, LG G2, LG G3, Sony Xperia, Note 10.1, and much more. Step 1. 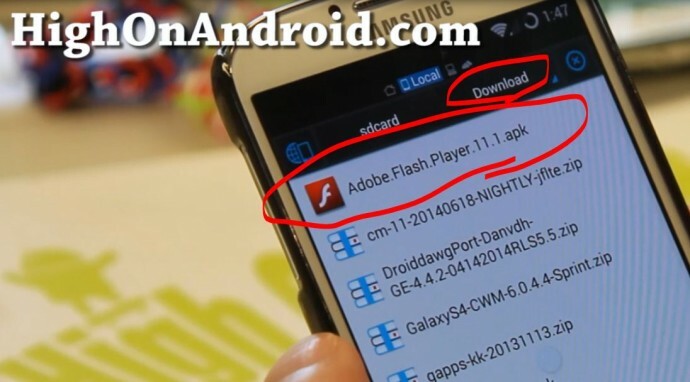 Download Flash Player 11.1 APK File and open with file explorer app such as ES File Explorer app. Step 2. Install the app. Step 3. Download and Open Dolphin Browser, which is probably the best browser that also supports Flash Player. Go to Settings in Dolphin Browser and make sure Flash Player is set to “Always On”. Step 4. Browse to any Flash-enabled website and you should be able to now have Flash Player working 100%. A: Yes, you can also use several other browsers that support Flash Player. But personally, I find Dolphin the best as it’s fast and Flash Player also works well. Q: If I install Flash Player on my Android, does that make it better than iPhone? A: Yes, your Android smartphone is way better than iPhone since now you can browse Flash-enabled websites, something iPhone can’t do. I have tried to use flash on my 4.4.2 HP Slate 7 Extreme but it does not work I have all the dolphin settings correct and have even uninstalled and reinstalled flash 11.1 but it does not work. Please help! Thanks. Puffin Borwser does work great! I had the same problem till find it! Thanks for the tip, Jorge. I got it! Just download Hacked Adobe Flash player from link. Make sure u uninstall any current flash player(s) running on your device. Go to settings (security) check allow installations of apps from unknown sources. Go to play store and download Dolphin Browser and Dolphin Jetpack. After installing for to Dolphin Jetpack first and make sue it’s enabled, then open Dolphin Browser go to settings click on Flash player. Set on. ” Always on” . Now go to any flash content website and ” Boooyaaah “. Good luck . I got a Motorola Droid Maxx from Verizon w current 4.4.4 update and I’m back in the game! I recently upgraded my motog with kitkat 4.4.4 version.Now no video player(mx player etc..) is running on it.mx player showing”unsupported andoid version”. Please tell me which video player supports in kitkat 4.4.4 android version. Not sure on Moto G as I don’t support that phone but MX Player should work on all 4.4.4 ROMs. Try another ROM then. I download the apk ,went to downloads but it says “cant open file ” . what am i doing wrong? Check the file, is it 6MB? If not, it’s a bad download, just re-download apk file. interesting, on the file description page it says 4.5mb and the download size is 4.5mb and the md5 compare is the same (unless I’m doing it wrong) not sure what has changed, but i can’t open the file either. samaung siii and android 4.4.2. Is it OK to install Adobe Flash Player with Dolphin Browser already installed on my Galaxy S5 ?? Or does it matter which one is installed first ??? Hrmmmm….downloaded the Flash Player 11.1, went to security and checked the enable sources, tried to install it but the install button doesn’t want to work. Cancel seems fine but install doesn’t do anything?! Please help. Using a Note 3 running 4.4.2. That’s because of half baked Android security feature — you have a service app painting over screen so even though it is trasparent Android prevents selecting sensitive functions since it potentially may have disguised the Install button. Disable service temporarily and retry. I am planning to buy the mini pc CS918 to convert tv into smart tv. it’s android base with 4.4 will the adobe flash player support this? thanks. Yes of course so long as it’s Android. 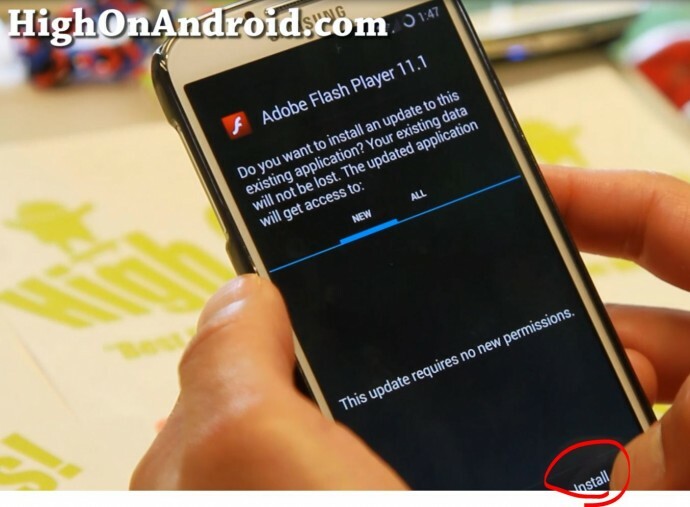 If i have an older version of flash player and want to flash the newer version/update, what are the necessary steps for a safer phone. Do i need to clean install my rom then reflash the new Flash Player? or Can i just reflash over the older version? I have moto g2 and its working fine flash file in dolphin browser. you should following given step by step. Go to dolphin browser and setting flash player option set flash player always on. after any swf file open with dolphin browser. if your file does not playing, you can refresh browser address twice. I followed all special instructions on my Samsung s5 phone with android 4.4.2 and it doesn’t work on a greeting card I received. What can I do now? 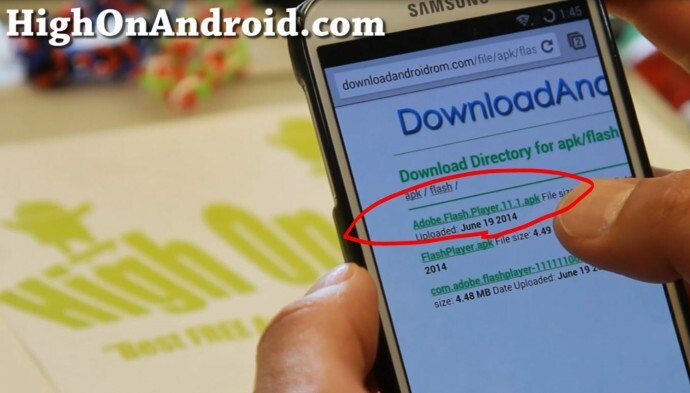 I downloaded the flash player 11.1 on samsung galaxy pro with android kitkat 4.4, but need the flash player for adobe connect which says that flash player 11.2 or more is required. When I click on any of the other links that are 11.2 or above they save as a zip folder and when I try to unzip it it doesn’t work?? Worked great for me on Galaxy tab 3 running kit-kat litter. @Yuntao is right. The procedure works perfectly but only with Puffin browser. I tested already Firefox, Maxthon and it doesn’t work; Dolphin Browser neither. If anybody else has tried with other browsers it would be cool to let us all know here whether it works or not. Same here: Lenovo Yoga Tablet 2, Android 4.4.2, installed Dolphin Browser and Jetpack with modified FlashPlayer for KitKat – keeps crashing. Puffing Browser works great though! My kids are happy! I too have a lenovo yoga tablet 2 but dont seem to be able to get it working. Ive tried puffin but it still doesn’t play. Are there any settings that you changed? I have Galaxy tab 4 tAblet running 4.4.2 I did everything and plays video but no sound. I uninstalled and did it several times but always same issue even tired puffin but still no sound. Can anyone help with this issue? I did everything on my Galaxy Note 4 but the flash player still not works. Can someone help me? I can’t seem to get dolphin to work it keeps crashing. Is there another browser you recommend? Will this solution work with Chrome? I just spent an excesive amount of time getting print functionality with Chrome, Docs, Cloud Drive and Cloud Print Plus. I don’t particularly relish the thought of replacing Chrome after all that work. And does Puffin encrypt passwords and ID’s? BTW: I have a Slatebook 14 with 4.4.2. 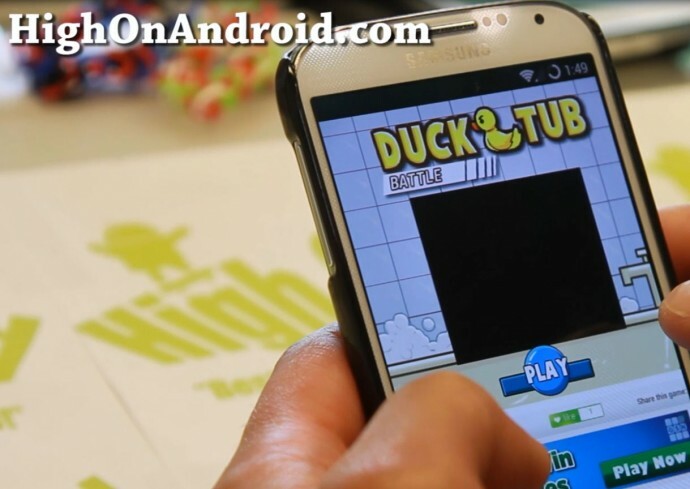 You would think they have something especially for the newest android version that’s straight from adobe. Why do they make it so hard is apple winning them over or something? I have a Trio Stealth G2 10.1 tablet ,and would greatly like to know what flash player I need to play flash supported games? Any ideas ? May I know why I do not have the option of using flash and must install silverlight? I am using Android so no silverlight. Also the site says to disable ‘Disable plug In to save power in safari. Is this the problem? Works Amazing. Dolphin didn’t work for me so i uninstalled. I then downloaded the free puffin browser and it works perfectly thank you for your help!! If i not download dolpin browser,can i use it on uc browser? Previous story Best Portable USB Charger for Android?